A new century of environmental consciousness is dawning. Under the pressures of explosive human population growth, our planet’s natural communities are shriveling rapidly. They are shrinking on all sides because of the expansion of agriculture, urbanization, damming, forest fragmentation, contaminants into water tables, road building, and even more indirect human impacts such as the invasion by exotic species and the distribution of genetic crops.1 In Nepal, ecotourists flock to hike one of the remaining wilderness regions on the planet, but these hikers have stripped the landscape bare of sticks and twigs for fuel and left trash that spoils the experience for future visitors. In the Galapagos, the burgeoning number of visitors strains these sensitive and fragile islands. The impact of these visitors, manifested by disease, fire, and theft, has altered the natural balance of the island ecosystems. In the last decade, approximately 20 of the 230 species of plants face immediate extinction, and another 10 are thought to be extinct.2 In contrast, I have witnessed the salvation of exploited tropical regions by the interests of conservation and the economy of ecotourism working collectively. Kenya’s Shompole Lodge [top left] supports the betterment of the local community, as does Milgis Trust that promotes conservation efforts together with the Samburu tribe. The walking safari is a tourist product that contributes directly to Milgis. Ecotourism probably had its foundations in the ethics of conservation, but its recent surge has certainly been due to its economic benefits as developing countries begin to recognize that nature-based tourism offers a means of earning money with relatively little exploitation or extraction of resources. It is this economic incentive, perhaps more than the consciousness of human ethics, that has given rise to the global expansion of environmentally responsible tourism activities. The objectives of ecotourism are to provide a nature-based, environmental education experience for visitors and to manage this in a sustainable fashion. As forests become logged, as streams become polluted, and as other signs of human activity become ubiquitous, the requirements of a true ecotourism experience are increasingly difficult to fulfill. To compensate for the “invasion” of human disturbance, ecotourism has promoted the educational aspects of the experience. Examples include opportunities to work with scientists to collect field data in a remote wilderness (e.g., Earthwatch) or travel with a naturalist to learn the secrets of a tropical rain forest (e.g., Smithsonian Institution travel trips). Environmental education serves to provide information about the natural history and culture of a site; it also promotes a conservation ethic that may infuse tourists with stronger pro-environmental attitudes. 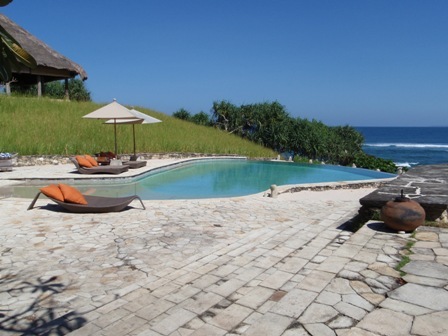 American Hotelier Claude Graves, founded Nihiwatu, an eco resort in Sumba, Indonesia, on the belief of impacting the immediate community. His Sumba Foundation has raised $1.4 million–most contributed by hotel guests–which has gone to help reduce malaria in local children, provide mosquito netting to locals, distribute medicine to needy children, donate services to local schools and help built 13 wells that supply potable water for 5,200 Sumbanese. These underlying principles are the pillars that will provide a lasting basis for ecotourism and will also create sound economic support for the conservation of natural resources. They provide ultimately competitive reasons for the expansion of ecotourism above and beyond other types of leisure activities. A challenge arises, however, when ecotourism becomes successful, in the sense that too many tourists destroy the reason for success. In the case of ecotourism, as different from many other marketed products in our Western economy, economic success is a matter of limiting supply no matter how much the demand. In a decade, this type of recreation has burgeoned to include many different intensities and levels of experiences, ranging from extreme rock climbing to nature journaling at a luxury mountain resort.5 There is soft versus hard ecotourism, alluding to the physical rigor of the conditions experienced by the visitors. Trekking on the Inca Trail is much more rigorous than taking a train or bus to Machu Picchu and staying in the lodge. There are arguments over the natural versus unnatural versions of ecotourism; in other words, proponents of ecotourism believe that humans are part of nature and that their impact is part of the natural process, whereas critics of ecotourism maintain that people simply should not visit natural areas because they invariably degrade them. Since Thomas Cook began the world’s first travel agency in 1841,13 the number of people who enjoy organized travel has continued to increase. Today, an estimated 1.6 billion people from all cultures and all walks of life participate in different kinds of tourism, spending over $2 trillion.3 On a global scale, ecotourism is growing because of its international appeal. Costs have decreased. Mass media have also popularized the notion of nature travel, especially through television networks such as National Geographic, Discovery, and Animal Planet and associated magazines or videos. Tourists recognize that if they travel with sensitivity to the environment, they will not only contribute to conservation but also become educated about a new habitat, country, or culture. Some countries have established eco-labels or certification for authentic nature-based tourism, such as Green Globe (international) or Committed to Green (Europe). This enhances the credibility of an experience for tourists who come to know specific reputable names. In contrast, some events in certain countries may impact tourism negatively, such as the recent bombing in Bali or the reputation of drug trafficking in Colombia. Exotic countries with stable governments, such as Belize, are the true beneficiaries of ecotourism and stand in contrast to some of their neighbors who cannot offer the same reliability of ecotourist experience. As politics continue to affect our ability (or lack thereof) to travel, regional tourism will be significantly impacted by government policies related to stability. Banana cultivators, lumber harvesters, and farmers are stripping the lowlands of rainforest trees. Costa Rica has proportionally less rain forest left than many other tropical countries. In fact, only a few islands of relatively untouched lowland Caribbean rain forest remain. Less than 10 percent of Costa Rica’s forests are national parks. The aerial tram had its origin in Don Perry’s efforts to devise tree-climbing techniques for scientific investigation. After experiencing the limitations of single-rope techniques, he realized that to study the canopy effectively, researchers need a vehicle for access. In 1983, Perry teamed up with the engineering expert John Williams, and together they created the Automated Web for Canopy Exploration (AWCE) at Rara Avis in Costa Rica. This vehicle can carry scientists from ground level to above the treetops through approximately 22,000 cubic meters of forest. After the AWCE was built, Perry and Williams designed the Rain Forest Aerial Tram, which was located closer to San Jose and more suitable for ecotourists. It occupies a 1.3 km route through pristine lowland rain forest. Twenty-four cars each hold up to six people, including one guide. The cars are attached to a cable that rotates around two end stations; the system is actually a converted ski lift. According to Perry,14 the site operated with enough profit to grant local school groups free admission. Displays at the site educate visitors about the tropical rain forest canopy and its inhabitants. This site is the first of its type worldwide, but more aerial trams and canopy walkways are now in operation in other countries such as Australia, Peru, and the United States. Paul Cox, internationally recognized ethnobotanist, has worked for many decades on the islands of the South Pacific. In particular, Cox spent many years in the village of Falealupo on the island of Savai’i. He befriended the village healer, a wonderful botanist named Pele, who taught him how Samoans use their local plants as an apothecary. In the early 1990s, Cox and I worked on an ecotourism project that we hope serves as a model for the application of ecotourism to conservation in the South Pacific. The forest provides all the needs of the village—spiritual, economic, biological— and had done so for many generations. Island ecosystems are chance events because the combination of species collects by means of drift, wind, and bird dispersal. Savai’i has unusual diversity for an island ecosystem. The villagers depend on the forest for everything: food, clothing, medicines, and homes. The forests even nurture island ancestors whose spirits are embodied in the flying foxes (Pteropus samoensis) that live and breed within the forest. The village was offered a large sum of money in exchange for logging rights to its forest. The chiefs were not happy about the proposal but they needed to pay for reconstruction after a devastating monsoon. Paul Cox had a novel suggestion for the chiefs: What about developing ecotourism to bring in a cash economy while managing the forest sustainably? He suggested a canopy walkway to attract tourists, who would in turn pay for the privilege of walking in the treetops of Samoa. A loan was obtained, and some generous seed money was provided from Seacology Foundation in the United States. Two research associates and I, representing Canopy Construction Associates, joined Cox for a reconnaissance trip to determine the feasibility of an ecotourism walkway in Falealupo. After many hours of discussion with locals, it was agreed that an enormous emergent fig would represent the center of all construction, from which bridges spanning the forest could be built to adjacent trees. We measured and mapped the area to gather all of the pertinent information required to construct the canopy walkway several thousand miles away. One of the drawbacks to construction in developing countries is that it is impossible to ask for new measurements or to get something checked in the field. In this case, we needed to estimate carefully all supplies and equipment coming from the United States. Canopy Construction Associates handed the job over to another, smaller construction team, Kevin Jordan and Stephanie Hughes, who were willing to build a simple platform around the fig tree and take on the risks of weather, financial liability, and lost or damaged equipment. The end result was a walkway that contributes to the economy of the village of Falealupo in a sustainable fashion and ensures the conservation of the forest for future generations. In the Marie Selby Botanical Gardens in Sarasota, Florida, a handicapped-accessible canopy walkway was constructed in 1998; and in Myakka River State Park just outside Sarasota, a public canopy walkway and tower, open 24 hours a day to the public, opened in June 2000. Both of these projects came from public funding and awareness of the importance of bringing people into forests. The botanical gardens walkway was the inspiration of a local builder, Michael Walker and Associates. Walker modeled his construction after the children’s book, The Most Beautiful Roof in the World by Kathryn Lasky.15 Walker carefully built a child-friendly structure according to Americans with Disabilities Act regulations, so that anyone—in a wheelchair, with a stroller, or with a walker—can enjoy the treetops. Delegates in wheelchairs cut the ribbon, officially opening the walkway. Many tears of joy were shed by these wheelchair-bound adults who had always dreamed of climbing a tree. has become exemplary throughout Florida and beyond. People from all over the country have learned about forests from the interpretive signage along the walkway. More importantly, they have also gained an appreciation for the beauty and value of forests in our daily lives. Ecotourism, in partnership with research, has the potential to significantly affect forest conservation in many positive ways. The question of sustainability remains unanswered because many sites with nature-based tourism are relatively new and the long-term impacts have yet to be measured. The challenges of removing trash from remote wilderness lodges, of bringing in electricity with low-impact electric wires, or of minimizing the introduction of exotic species require the test of time to determine their success. In the not-too-distant future, our wilderness areas will be small islands of biodiversity amidst seas of domesticated landscape. As the planet’s natural, relatively unaltered ecosystems become increasingly rare, ecotourism allows more people to see our isolated populations of wildlife, while benefiting local economies. Ecotourism has an impact on natural ecosystems, but more importantly, it offers a way to promote conservation in ecologically fragile regions. Margaret (Meg) Dalzell Lowman, Ph.D., is currently professor of biology and environmental studies at New College, the premier honors college for the State of Florida and Ecological Consultant for Sarasota County. From 1992-2003, she served first as director of research and conservation and then as chief executive officer of Marie Selby Botanical Gardens. Prior to joining the gardens, Lowman was a professor in biology and environmental studies at Williams College, Massachusetts, where she pioneered several aspects of temperate forest canopy research and built the first canopy walkway in North America. From 1978-1989, she lived in Australia, where she taught at the University of New England and worked on canopy processes in both rain forests and dry sclerophyll forests. Lowman has authored over 80 peer-reviewed publications and 3 books. Her latest book, Life in the Treetops, received a front-page review in the New York Times Sunday Book Review. Among Lowman’s awards are a Pew Fellow nomination (1993) and the Eugene P. Odum Award for Excellence in Ecology Education from the Ecological Society of America (2002). Carolyn Shoemaker of the U.S. Department of the Interior named an asteroid after Lowman (2003). Meg received a M.Sc. in ecology from Aberdeen University (1978), and a Ph.D. in botany from the University of Sydney (1983).